Welcome to the Mission Briefing Room. This room is located next to the Captains Office on the left hand side. Whenever there is an urgent situation happening where a relief or rescue squad is needing to be sent out all members involved in the rescue will meet here. In this room is a large desk surrounded by chairs. A large window that overlooks part of the Seretai. On the backwall is a whiteboard, as well as a map of various locations both in the Seretai, and the Rokungai district and Human World. There is one for Hueco Mundo as well but not much is known about the area so not alot of information is one here. Outside of this room a Sekaimon can easily be summoned to transport the team wherever they need to go. Mind you this still needs some prep time to be activated properly. This room is not to be accessed unless in cases of rescue missions and outside of that is only accessible to Captain or Lieutenant level members due to security and confidential materials. The quiet halls around the Briefing room started to resonate with the sound of clanking shoes. not sandals or there wooden variety but actual shoes. The light from the briefing room soon showed the silhouette of Tatsuki in her new squad uniform. mostly based on the shikausho with some new high heels and fighting gloves. she had in her hand a clipboard, pen, and documents. her short hair was combed back and held by a cute dog clip on one side and a punk rock skull and crossbones on the other. As she entered the briefing room she sighed and saw that not even the captain was there to greet her. She went to work on her own getting the room ready for presentation setting up the board, handing out documents to all the chairs at the table water for each chair for when they got thirsty, and even in consideration some cookies she had bought in the middle of the table. she also bought out a small stack of cooked ribs and smiled, "Hopefully that'lll get that puppy to like me~" She had a missed last time she had met the squads mascot, the shibu inu that had turned her clothes into bee's and left everyone else in a uncomfortable position. She wanted to try and amend that by giving the puppy something he'd like, she'd hope this plate of ribs would do. She layed the ribs in a spot where she thought the dog would take his seat at the table and placed it down there before moving on to her other duties. Adjusting her glasses she got most of the other utilities ready for the meeting and then proceeded to wait by the door like a maid waiting on the master or mistress of the house. Florence walked towards Squad 13's meeting room. This was to be her first mission, and she had to do this properly. Medical Kit? Check, hanging on a loop at her waist. Wakizashi? Check, polished and sharp, secured in a scabbard. Indeterminate amount of knives and other assorted stabbing implements? Very check, hidden across her body, underneath her bandages. Rosseau? Always, o hero mine. Her bandages tightened as if giving a hug. Florence smiled. Check. Turning the corner, Florence spotted a woman standing at the door to the meeting room. "Hello there, is this the right place? I am Florence Engels, from Squad 4, here for a patrol on earth." Tatsuki heard the pitter patter of a a light footed person coming towards the meeting area. On alert she held onto her zanpakto for comfort before looking at the grey haired woman. When she asked about the meeting room Tatsuki nodded " Yes miss, I am Tatsuki In'ei, the meeting hasn't started yet you're the first to arrive other then myself. take a seat that isnt infront of the ribs there is beverages and cookies for your pleasure. I understand you're whats called a 'field medic' what exactly is that if i may ask?" Tatsuki asked the last bit standing vigil as she let Florence into the meeting room. She had little knowledge outside of hueco mundo other than surviving in the skies and not getting caught from up above or down below. Walking along the hall an odd rhythm of steps could be Morgan heard from down the hall. Her crutches landing at the same time making an odd sound. Her black hair flowing lightly behind her as she somewhat hobbled towards the mission briefing room. She kept her reiatsu calm and controlled but internally she was angry, concerned and a whole other range of emotions. Being a new Captain Morgan had already struggled for the respect of the other Captains. That much was clear considering how much the Captain Commander seemed to doubt her. There was no way she was going to allow others to think of her in this way. Morgan seemed lost in thought as she continued to walk down the hall. Taking a deep breath as she composed herself a bit more. She knew the possible danger these individuals were in but she had to do what must be done. Finally coming up into the mission room Morgan kept a kind smile on her face, hoping her reiatsu would calm the individuals in the room she kept it calming. Her eyes looked around spotting Tatsuki and then a squad four member. Keeping note of the cookies and other items in the room Morgan would give a nod of her head to Tatsuki smiling gently while leaning on her crutches for support "Thankyou Tatsuki. It was most kind of you to set things up. The Captains meeting was rather long." She would then look over to the squad four member with a kind smile. Morgan didn't look super healthy if one was perfectly honest and she knew that this one would probably pick up on that but Morgan would hope she wouldn't take too much notice. As she moved her way over towards the chair at the front of the desks Morgan would then speak to the two of them "Thankyou both for coming. We are awaiting some others before continuing." 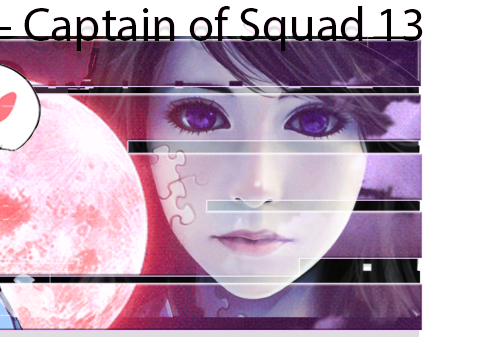 Her eyes would then look to the one she hadn't met yet "Welcome to Squad thirteen, I am Morgan Shouri, the Captain of this squad. It's a pleasure to meet you." Da dum da dum da dumdumdum~! From five to squad thirteen, Natsumi Yamura was on her way towards the meeting room, her hands casually in the pockets of her hakada while humming a usual good-humored melody. Aside from the shirt hakada todays skirt of the day was dark red plaid with matching black kneehigh stockings, and black fancy heeled boots. She was hoping not to be too late, having been somewhat lost on the way. Thirteen was a squad she could never remember the roots to, and with her zanpakuto nicely sheathed to her right thigh, the officer was ready to get things started. Tentatively it had been awhile since the pinkette had done any missions and there was no time like the present. Keeping a lollipop between her pretty lips, Natsumi had finally managed to find the room she was finally looking for after ten minutes of searching, the soothing caramel apple flavor keeping her soothed. Only one person was awaiting outside the door of the room, as if ushering the people into the room to let them know the meeting was there. She "Oh my~! This made the search so much easier~! I hope I am not too late! Oh my goodness though~! Is that cookies I smell in the other side of the door!? Smells fantastic~!" In thanks for Tatsuki opening the door, Natsumi had quickly opened up her tray of custom-flavored lollipops, handing the other female a caramel apple flavored one like the one she currently was enjoying. Once the door was opened she entered through with an embarrassed smile on her face. "I apologize for being so late~! Natsumi Yamura, reporting for duty~! If it were not for more then just pleasantries, I would have brought my hello gift with me Captain Morgan. It is delightful to see you in good health~!" Bowing politely, Natsumi had thn faced her attention to the other two in the room. Hrrrrm~! One carried the medical smell of the hospital, that much she could tell thanks to her fantastic sense of smell. It was lingering around a pretty kimono-clad woman with white hair. Morgans' scent carried the same as the female who had been standing outside the door. Lovely~! Squadmates~! Humming under her breath, she made way to a free seat, tightening the ribbon keeping her hair up awaiting patiently for the rest to happen and to begin. A trip to the human world? A trip with squad 13? Definitely something he should be into. He didn’t hesitate to jump on joining the mission. He didn’t know much about the squad 13 captain but he heard some interesting things making her a perfect person to be around. See what dirt he could grind up. It wasn’t hard being a spy but it was something he had to almost will himself to remember he was doing. He was squad 2 on the surface but below he was something more .Squad 9. Still, that was hidden and unknown and the number that counts as his alias was the only thing that connected him and the reports that ended up in the squad 9 system. He finally got custom robes. Sleeveless top, that met lower than usually in the front revealing his chest. Underneath the black fish netted shirt in which the sleeves netted his arms. His hair was laid back in a ponytail instead of hanging loose. It seemed to be longer in inches, the tips of them a bright pink as the pony tail seemed to fall down to his back a little. His pierced eyes relaxed as he made his way through squad 13. His demeanor, calm and collected. He hadn’t used his zanpakutou in a minute and that was a good thing because he didn’t have to deal with emotional toll of daily interaction with sword and beast. The beast ironically the hollow within that he swears reminds him of a splitting image of his daughter. He refuses to believe it is her. Making it to the meeting room, he would head in quickly, his mind processing the situation. He was taking in who was all around. Who was there. It was a simple mission to the world of the living right? So, why did this seem more important than the usual? Maybe he was reading way too much into it? Didn’t matter. He would look at the current events unfolding. He found the captain. Morgan. Squad 13. She was being greeted by some pink haired woman who seemed very vibrant and cheery. In fact, it was a little concerning in a way. Also reminded him a little of Eva, but not to point to trigger a slight depressive episode. Instead, he would try just chill and stay low key while doing his best to see where the conversation was going and what he could hear. Did something happen to this Morgan woman at a previous time? He didn't know. He figured it wasn't important. If the pink haired woman knew about it, then was public knowledge. Not something important to keep note of. He decided, now was good to make his presence known. "Hades. Soldier of squad 2. Reporting" he stated simply before yawning. "Hopefully, this isn't too much work"
So this was Squad 13, huh? Pretty swanky. Compared to her own division's traditional aesthetic, Hitori was rather a fan of the somewhat more modern approach to interior design they'd taken in the rescue division without losing all of the rustic charm or verging into boring minimalism. The garden she'd spent maybe a little too long wandering through on her way to the briefing was about as old school as could be managed (she'd made a mental note to bring Benida next time, figuring her pond cryptid in crime would probably enjoy the water features) but the deeper she went toward her destination, the more obvious it was that they'd updated their tech whenever the need arose. Weaving through the hallways revealed the occasional server room off to the side, as well as several large operating centers where soldiers coordinated ground teams, providing information and responding to incoming requests. On a typical day, Hitori would have ducked in and chatted a bit to learn about how this whole setup functioned, just in case it might come in handy later, but there were other things to attend to and she didn't linger long. It was just nice to confirm there were more eyes in the sky looking out for them than just her avian cohorts. There were also the looks everyone seemed to be giving her, something between curiosity and disbelief, that dissuaded the attempt at gathering background intel. You'd think they'd never seen an officer before... was Hitori's bemused takeaway as she weaved down the last few winding corridors to arrive at the briefing room, carefully orienting her right arm, clad in a black leather glove that reached nearly to her shoulder, so that the almost three foot long Mountain Hawk-Eagle perched there wasn't bumping into anyone and missed the doorframe as she entered what appeared to be a conference about to kick off. She was just in time as far as she was concerned, with nothing yet accomplished and likewise no real preamble to sit through from the several mystery people plus one immediately recognizable captain. She'd heard from a guy who heard it from someone who knew someone that Morgan Shouri had taken three royal guard to the mat and sent several captains and lieutenants to the 4th division, but Hitori suspected that the tale had grown as it traveled and probably wasn't entirely true. As for the rest, she'd more or less let them show her who they were through the process of this meeting, her lilac eyes sharp and scanning for the slightest bit of information as she found a seat at the large table, letting Takamatsu hop down from his perch onto the table and... spotted a plate of ribs just kind of sitting there. Awesome, already off to a confusing start. There was a woman at the front of the room in a dress that managed ride the line of tastefully skimpy if you ignored how sympathy-wince inducingly topheavy she was, and Hitori was tempted to inform her that the humans had invented a reduction surgery that might save her spine. She seemed to be staring rather intently at a very tall, very skinny guy who appeared to have wrapped armor around the waist of a school uniform, but seeing as Hitori estimated she'd barely come up to his shoulder in six inch heels, clearly he wasn't a student. Bored though he seemed, his eyes were a little too keen for him not to be paying attention, and that was at least a bit reassuring. 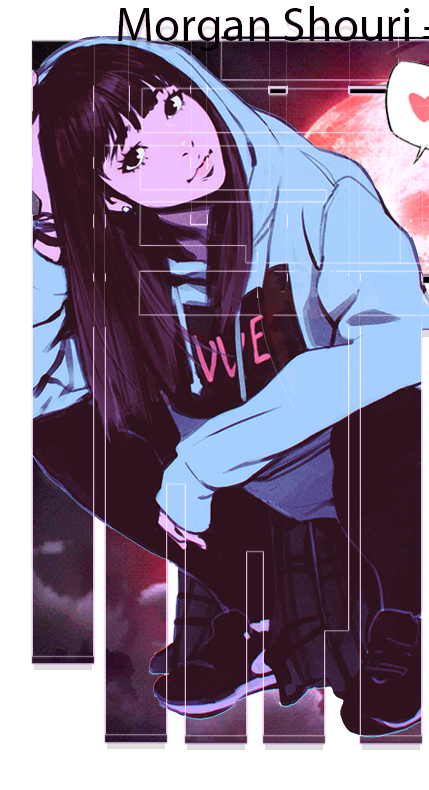 The next member of their team was cheerfully humming and adjusting a ribbon in her bubblegum pink hair, though Hitori could have sworn she spotted the woman's nostrils flare lightly, which was ever so slightly odd without a visible mask fragment anywhere. Maybe it was just in a place where it could be hidden under her clothing? Clearly it wasn't on her legs, where from the waist down she seemed to be a punk rocker, but the top was more old school Japanese so if anywhere it'd be there. Who could really say. The last member of their motley assortment honestly should have stood out the most, given all of the bandaging, the blindfold, and the fact that she was wearing an outfit that was actually so demure it was startling. You just sort of got used to dudes with open shirts and girls wearing skintight tops with miniskirts all the time, so seeing someone in traditional clothing, worn correctly to boot, was more than a little shocking, and all the more appreciated for it. Maybe it wasn't the most convenient thing for field work, but it certainly raised Hitori's morale that there was at least one other sensible person in the world. Honestly, Hitori felt like she stood out from just how normal she seemed. Standard uniform bottoms bound at the calves, the standard uniform top taken down to carefully cover a pair of leather satchels on her hips, and a tank top in a pastel lilac that played nicely against her tan, freckled skin was unique more for how relatively average and functional it seemed compared with everyone else, save for the overgrown schoolboy who also dressed pretty conveniently. Idly, she reached down to one of her small bags and pulled out a strip of raw meat for her bird, who greedily gobbled it up and gave a distinctly happy screech as she gave him some soft scratches around the head, considered her options, choked down that bit of self-consciousness that had plagued her, and decided she could probably work with this, if push came to shove. She could introduce herself if someone asked, but the primary focus for Hitori was just to get all the necessary info for their trip to the human world. Pleasantries could come after that. "I am sorry captain, May we start the meeting now? Florence smiled at the secretary (? ), and tried her best to explain. "A field medic is someone with enough medical knowledge to keep her team alive, and enough martial skill to keep herself alive. As a shinigami, I'm very inexperienced, but given that this is a routine patrol I'm confident in my ability to keep you all healthy." Florence nodded at Tatsuki as she entered the room. She marveled at how modern the room was, all sharp angles and polished wood, with a massive window looking out into the city taking up an entire wall. She took a seat on the comfortable leather chairs. There was a plate of cookies on the table. 'Only one,' Florence thought to herself, as she took a bite. 'Perhaps two,' she thought, as she finished her first. Florence watched (discreetly munching on cookies) as the room filled with individuals that varied wildly in appearances, all wearing different styles and colors, and she couldn't help but think of the difference between the Seiretei and the outer Rukongai. They were like different worlds. Eventually, a person in crutches ambled her way into the room. Florence winced as she recognized her as Captain Morgan, who was brought to Squad 4 some time ago, terribly injured. At least she was well enough to move. Tatsuki followed Captain Morgan in, and with everyone settled in the room the meeting began. As each individual entered the room one by one Morgan made a move to stand up leaning her back against the wall next to the whiteboard and the map. Her eyes looking calmly at the ones starting to gather in the room. As a familiar reiatsu approached the meeting room a small smile would graze Morgan's lips. It was comforting to know there was someone joining this group that Morgan knew somewhat well and it helped her relax slightly. As she came into the room Morgan would admire her choice of clothing she really did like her choice of clothes. If only Morgan was so daring but all she really knew was her uniform and the arrangement of Kimon's and Yukata's she had laying about. As she came in Morgan's eyes would meet hers and gave a brisk nod in greeting. Laughing lightly to her comment Morgan would reply back kindly "It's been too long Natsumi. Please, no need for any gifts, seeing a familiar face is good enough. As it is to see you. Please feel free to take a seat anywhere while we wait for more to arrive". It wasn't too much longer than saying this that yet another signature had entered. Morgan's eyes looked up at him as he walked in as her purple eyes watched him with interest. An interesting choice of attire but one that seemed to fit him perfectly. If it wasn't for the fishnet top Morgan was sure to have a nosebleed. She wasn't overly experienced with men and had to admit she had a soft spot for good looking ones, but she only really had an interest currently in one other and unfortunately, he would not be present for this meeting. As he walked in Morgan noticed his calm demeanor and it was something she had appreciated. Being calm right now was the best thing for this group... for when she started the meeting things were surely not to remain as such. "Welcome Hades. It's a pleasure to have you join us. Please feel free to take a seat. I am Morgan Shouri, Captain of this squad". She would then give a bow with her head before standing upright again. As another came into the room Morgan seemed tenser this time. Whoever the next one coming was seemed to carry an air of confidence. Not that this was a bad thing though and the mere thought of it brought a smirk to her lips. As she came towards the door Morgan's eyes would widen in surprise at the hawk perched on her arm in a somewhat majestic fashion. Her eyes stared in wonder with her jaw almost dropped at how amazing the bird looked. Morgan had not seen a bird of this type in a very long time, but it did make sense as the occasional hawk she had noticed in the air once and a while and it now made sense as to who it belonged too. Not that Morgan ever considered it a bad thing, but it was nice to have closure to a question that was often playing around in her head. As she examined the woman Morgan took note of her outfit as well. It seemed how everyone had their own unique style and it was rather interesting. Looking down towards the ground for a moment lost in thought Morgan would look back up, just in time to see the woman feeding her bird and again a smile would form on her lips. Her calm reiatsu would seep out in an attempt to keep the room relatively at ease. She hated the whole Captain thing sometimes as she didn't want to be looked at as the higher authority and more on equal terms but unfortunately the Haori didn't help matters in that regard. She would then speak to the woman with a smile "Hello there. Welcome to Squad 13. I am Captain Morgan Shouri. It's a pleasure to see you join us, as well as the friend you have brought there. Very beautiful creature and one that I think will come in handy." Morgan then took this opportunity to look around the room, memorizing the faces here... for she knew... it could be the last time she might see some of them. As Tatsuki then spoke Morgan would shake her head to stop herself from spacing out. "Thankyou Tatsuki, however, it's probably best I go over everything. There is quite a bit of information to cover but I do appreciate your wanting to help. Thanks as well for bringing refreshments for everyone.. Morgan would then look to everyone and smile before her eyes would fall onto the Squad four soldier nodding in approval "That is precisely right. Squad Four is very important not only to this mission but to Soul Society itself. I may not still be here if it wasn't for them" Laughing nervously Morgan would then shift to the side but still leaning on the wall behind her for support. She couldn't risk them knowing the reason for her injuries, for if they knew she feared that they may be scared of her. Her eyes then going serious "Now that everyone is settled, I'm going to begin shortly. I will pause momentarily for questions. Before I get started, does anyone have anything they want to say or ask?" Those violet eyes would continue to look around the room as Morgan became a tad more serious, if one really looked into them or knew the situation, they would understand that this mission could turn into more than just a simple patrol. Woah! Must be difficult with greeting a whole ton of people at one swing! Natsumis' quick pleasantries were well mutual, rather pleased to see Morgan was pushing to do a mission despite recent news the pinkette would hear through the grapevine. The spot in particular she had picked was rather cushiony~! Ahhh~ Such comfort to ones behind, decent on the backrest. It was well worth the choosing. It was only luckily for the woman that there were more people arriving, Hot dang those ribs across the room smelt DEEELISH! They looked delectable enough to make her almost drool in the corner of her lips, which was luckily out of the sight of the others. It was hard though not to hold their fragrance to heart without making it to obvious. Of course the assorted scents slowly uprising around were enough to make the pinkette at least pay attention better. Aside from the overly eager person announcing about food, and the silent woman who seemed to be enjoying the cookie they were partaking on, the unknown amounts of spiritual energy were interchanging up to the arrival of more people. Hopefully they stuck out more on the unique level. Luckily for her those words were about to be devoured in a literal sense by the upcoming arrivals. One prime example was a rather handsome gentleman on the scene, over a definite six foot in height, with golden eyes that lead to mystery. His scent carried a very unique aroma, nothing familiar about the particular squad he could possibly be from. It wasn't until he had introduced himself as only Hades with no last name, and a soldier from two. Interesting. Was he perhaps tired as he spoke? The yawn he gave off could have been taken either direction from bored to tiredness. His parting words made her give a slightly feral smirk of amusement, merely enjoying her lollipop in quiet reserve for the time being. The plan was to observe each person before deciding how much of herself she could actually be. Of course that thought was crossed out quick. She was going to be overly bubbly as per usual. No point to prove or change oneself. If only one thing could have been said for the woman who was watching Hades with a rather suspicious look that was hard not to miss. It was best for someone to point it out sooner or later. Was it because of his choice of clothing!? Natsumi personally thought he was rocking the fishnet shirt!! Very few could pull it off. To Tatsuki she could not resist documentary, a second longer, merely wishing to get any of the possible bad steam out of the blue and away before the mission. "Hey now sweetie! You keep staring like that you may make someone verrrry uncomfortable~! We don't need those pretty eyes freezing in a permasquint~!" Before any other thing could be said on that topic, the arrival of the next to enter made the jaw completely dropped. WHAT THE HELL WAS THIS LADY BRINGING IN!? Entering with utter shock, was a lovely woman with tomboy features, whose pretty lilac eyes gave off the presence of observation among others. At the same time they were standing out well against the tan she had. The outfit was not what made her jump, as they were very functional and frankly she had no idea her own choice of attire had been critiqued... The looks were not what made her jolt or be wide-eyed for a moment.... It was the feathered creature of flight she had carried into the room. What the hell was that!? An eagle!? A hawk!? How long was that thing!? Okay okay okay calm down... calm down!!!! Oh!! A bird that enjoyed meat!? Well now, that was a pleasant thought to relax about... She liked to eat meat as well.... Of course cooked meat. Thinking in that matter helped her manage to literally be more in awe once the inner panic settled down. Hm....decent feathery colors of ... Tawny? It was more exotic the more she thought about it. The attention on the bird especially did not last very long, the moment Tatsuki was giving the impression of trying to be in charge of starting the meeting. For a fifth seat she was really kissing the booty up was she not? It was improper for someone to be acting in such a matter. It was lucky Morgan had spoken to the woman first, as a second longer and the Tatsuki lady was about to get a speech she would never forget about mission meetings. Lucky for her she was about to be safe. It as that inner cherry bomb attitude that was left burning in the back of her throat. First impressions were everything after all, and this was not the time. Ah well, she would get over it quick anywhooo~! Patiently she awaited or the captain to prepare herself before they would speak. So far so good asking about questions before speaking was a nice beginning step to work with. The look in the captains' gaze showed hints of utmost importance to the upcoming mission detail, which caused the pinkette to keep better settled, finishing her candy quick, chewing on the apple flavored stick in her mouth while keeping her own focused stare among the ebony-haired woman. The Kageryuu made it a point to not say his last name for a reason. He didn't believe in them anymore. He was not one. No matter how much lip service that Xaiyou and the others wished to thrust upon the golden eyed death god, he was not having it. Especially, when he found out about the truth of the Kageryuu in the library back during his research in squad 2. That reminded him, the teal haired woman, he needed to go visit her one day. His mind was preoccupied which made the situation lucky for the woman that was staring at him. Hades, while lazy, could be very petty and he would in fact would love to know why she was giving him such a stare when he done nothing wrong. The only hint he received was hearing the words of the pink haired officer that was among them. He couldn't inquire because more showed up onto the scene. Hitori, he did not know and honestly wasn't really bothered by the fact the officer was accompanied by a friendly bird fellow. Why? It was not anything demonic or crazy in nature. Just a mountain hawk -eagle. He did wonder one thing, did it relate to her zanpakutou? Plus, Hades could literally turn himself into a crow. Actually, that may be the big key reasoning behind why he was not really afraid or overly dramatic. Starting to take a seat, he would hear the greetings from the organizer of the trip. Ms. Mogan herself seemed to made it her mission to make everyone feel welcomed. Unlocking the level on the lower chair to cause it to lean back unrestrictedly, he would slouch back as he watched the silliness that was occuring. Someone was protecting ribs? A squad 4 soldier entered into the fray and munched on cookies. This was a little, concerning. Still, he knew this place had some character. Looking at the woman that was staring at Hades, he would look at the woman interesting to the master bird officer and ended up slipping to far back, falling onto his back. He bumped his head a little, but it was okay as he was dying laughing at this. Awkward and low key perversion. OH my! "Ms. Shouri I do apologize, but I don't think it's smart to have your side piece on a mission like this. Feelings may lead to ignorance and mistakes!" Did Hades think that this woman was truly Morgan's lover? NO. But, the way she addressed her captain was too good to overcome. He never heard anyone call their captain "mistress". Maybe the term has changed meaning? "Sorry Morgan. I do have a real question. There is way too much proper planning going into this mission. It's not a simple patrol is it? A patrol of the human world on average maybe take a person or so to do. We have more than that and even have specialized allies here such as a healer. What, are we really doing here?" he asked. There were 5 people so far and who knew how many more was coming. He may not be told the truth, but Hades just felt like they were more searching for something than patrolling. When he use to lead the gang BVD, he didn't send many people to patrol the territory. He sent only 3 at most and they were small fry. No need for a ringer or a higher in command in the gang with them. So, with that previous experience, he just felt something wasn't adding up. He could be wrong of course. Hades continued to lay on his back, still connected to the overturned chair while he waited for an answer. Maybe he would get one. Maybe she would double down on the mission just being a simple patrol. In the end, he just hoped Morgan would tell them the truth so they can be mentally prepared. The last person to make his way into the briefing room would be a rather large wall of a man some might say. The door to the room creaking open and a hunched over figure made his way through the doorway that he definately would not have fit through were he standing at full height. After entering the room the gray haired individual would stand from his hunched position. A towering seven foot ten inches old man was now within the meeting room. Looking around at the others who had seemingly decided to partake in this mission. His garb was nothing like the typical shinigami garb. His clothing much more like that of a modern english royal than it was japanese at all. His blade at his side as he stood tall, a katana which while might be considered larger than normal for others for someone of his size equated to normal. "I am sorry I am late," The tower of a man would begin. 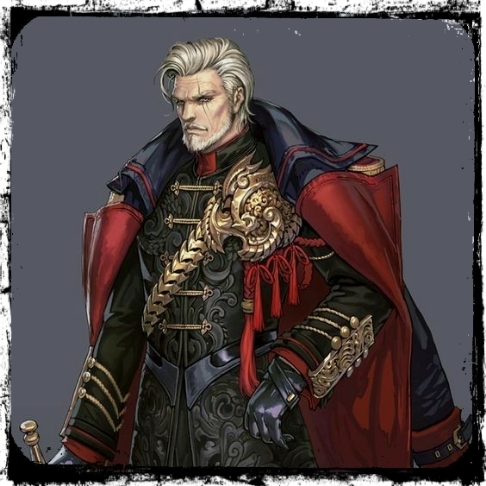 "Avedis, Elder of the Kageryuu, currently between squads, considered a mere soldier rank as of current, this will be my first mission since returning to this particular occupation so to speak. It will be a pleasure working with all of you." The old man spoke in a rather deep voice, polite but somehow scary in a way. His expression was rather serious. He thought his introduction was rather quick and to the point. From there he would simply wait to receive the information he required about the mission they would be partaking in.